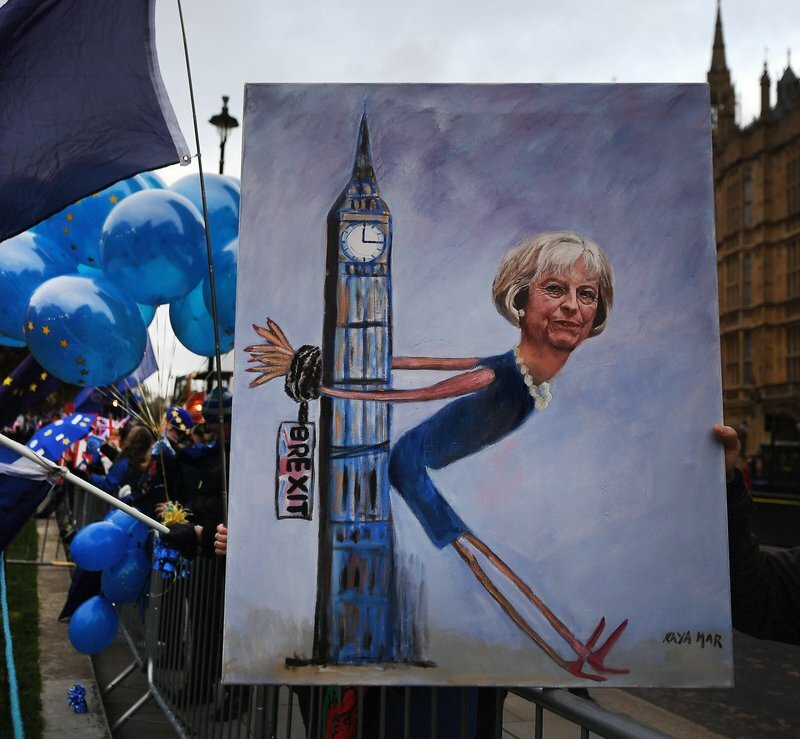 Kaya Mar art at a protest against Brexit in London last December. EFE. Brexit started with a nasty rash of jingoism and xenophobia: Swedes in the street were told to ‘go back where they came from’; Spanish doctors were asked (by their regular patients) when they were leaving the country; Poles were beaten up at random, and so on. Then the lies and shenanigans behind the Brexit campaigns came to light, when it turned out that the UK’s financial contributions to the EU were not going to be injected into the National Health Service as promised; that voters in the Brexit referendum had been targeted using information lifted off Facebook by a shady Canadian subsidiary of the now defunct (and discredited) US firm Cambridge Analytica; that the leader of the Leave.EU campaign, Arron Banks, had funnelled an illegal £8,000,000 into it from the Isle of Man, an offshore tax haven. On top of which, large numbers of European workers in essential services such as health and pubs have moved to more foreigner-friendly climes; the pound sterling is worth 14% less since the referendum; nine billion pounds were pulled out of funds invested in British companies in 2018; some of the biggest banks on the planet have started to move staff out of London (usually to Frankfurt or Dublin) and several major EU companies with plants and investment in the UK are also getting ready to jump ship; the latest reports reveal that Britain is on the brink of a financial crisis similar to that of the 2009 crash, only this time it would suffer on its patriotic tod. (All figures are from the Guardian, The Independent and the Financial Times). And then there are the curious individuals spearheading a hard Brexit, such as the former foreign secretary and painfully unfunny, self-made buffoon, Boris Johnson, who now takes his advice from the American neo-Fascist (sorry, ‘alt-right’) one-time Trump adviser, Steve Bannon; or the ever so pro-Brexit Conservative MP, Jacob Rees-Mogg, who belongs to something called the Cornerstone Group, whose motto is, wait for it, ‘Faith, Flag and Family’ (and who looks uncannily like the pitchfork wielding farmer in Grant Wood’s ‘American Gothic’); bringing up the rear end, we have Tommy Robinson, a gentlemen who used to belong to the thug-loving English Defence League (and the even righter-wing British National Party) and who, in December of last year, led a major pro-Brexit demo. Watching all of this unconsciously comic, consciously duplicitous taurine excrement being deposited in the media for nigh on two and a half years reminded this Anglo-Catalan resident of the excruciating mix of laughter and horror that we feel when viewing the blackest moments in good cringe comedy; for example, the ‘Fawlty Towers’ episode called ‘The Germans’, in which a mentally disturbed Basil Fawlty imitates Hitler in front of a group of weeping German guests. And talking of Mr Fawlty, if he’d been around for the Brexit referendum, we all know which way he’d have voted.